This delicious salad is packed with superfoods that will help you burn fat, drop pounds, and stay energized. Stop counting calories and try this recipe to lose weight faster. 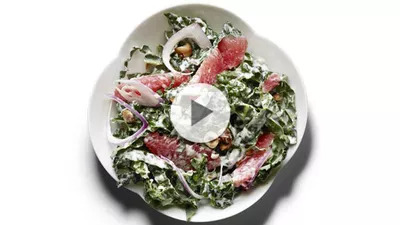 This salad with raw kale, grapefruit, and toasted hazelnuts is packed with superfoods that will help you burn fat, drop pounds, and stay energized. The star ingredient is grapefruit, one of the top superfoods for weight loss. Studies show that adding this fruit to your meal may boost your metabolism and help you lose weight over time. This salad also includes kale, a nutritional powerhouse packed with vitamins A, C, and K, and hearty dose of minerals and fatty acids. Add some tasty red onions, yogurt, and lemon juice, toss it all together, and you'll have one of the healthiest salads you can put on a plate. Watch the video to see Health food director Beth Lipton explain the science behind this amazing recipe.